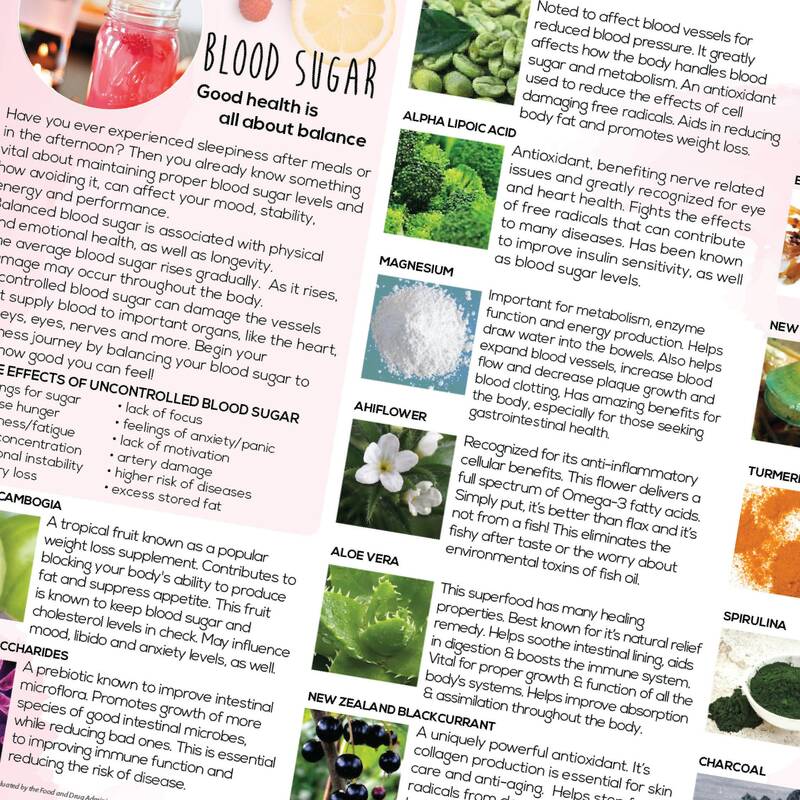 This brochure explains what the ingredients can do for your body and how you can benefit from each one. 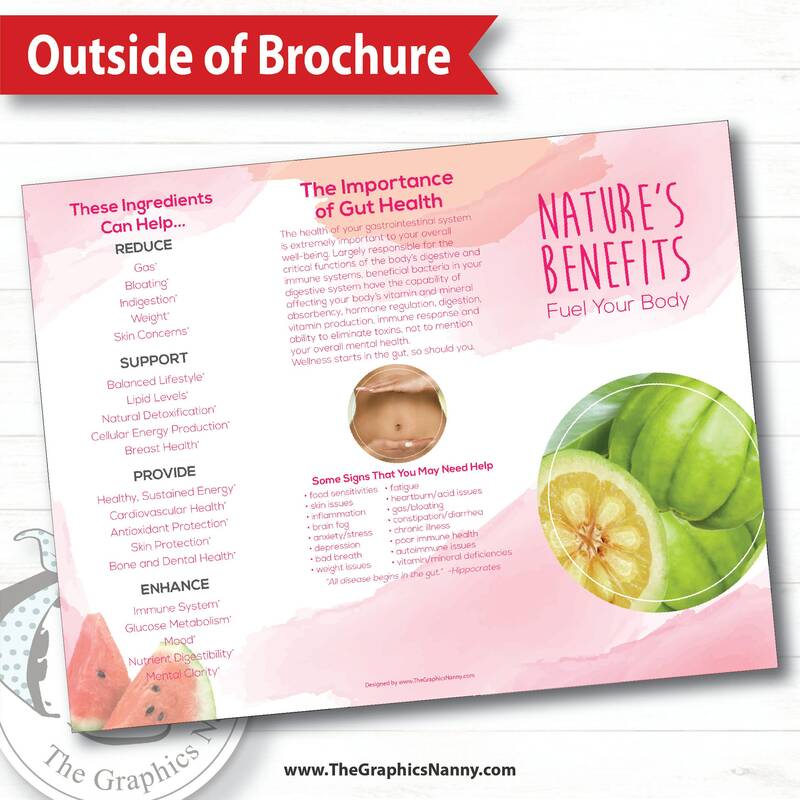 ♥ Leave a stack in your purse, office, car, etc for immediate availability. 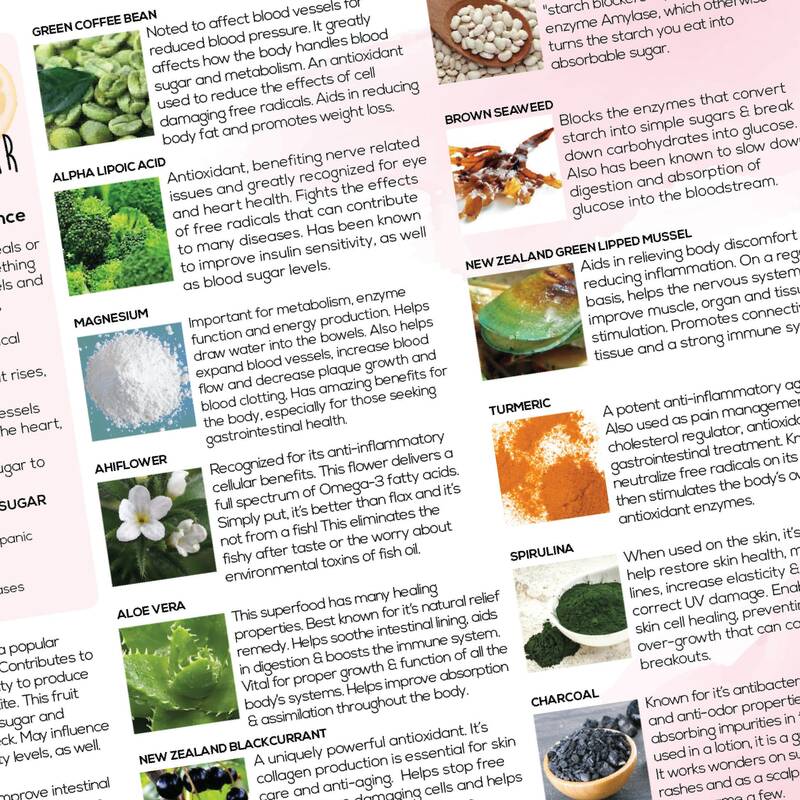 ♥ Give a few to non-ambassador friends, in case they know someone that may benefit. 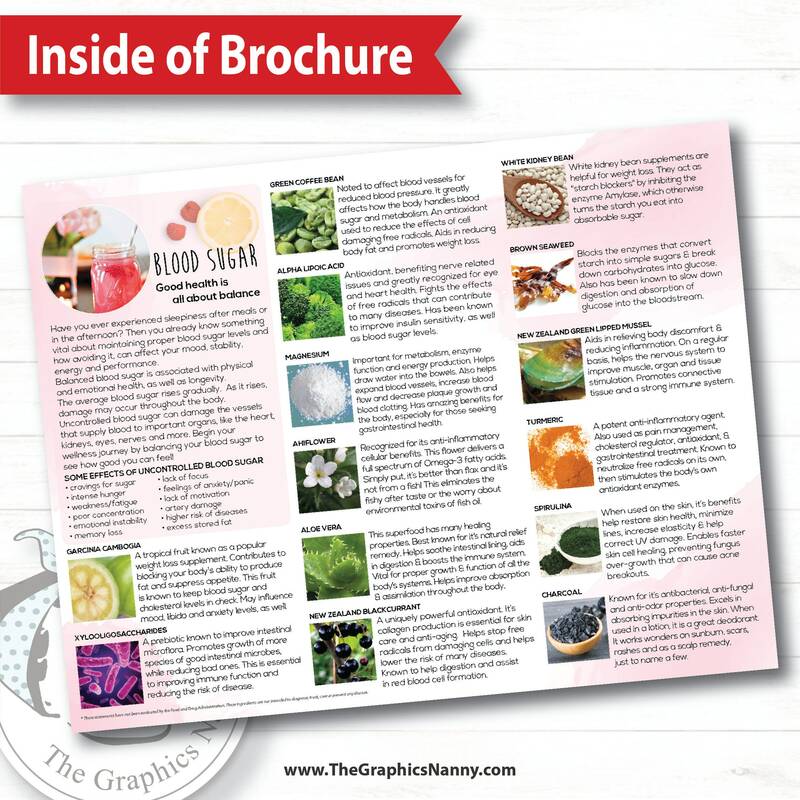 ♥ Hand out to your downline as a "starter pack" and help build your team a little quicker!! ♥ Use as an incentive/contest on social media on your team pages. ♥ Use as a raffle prize for your next team meeting. 2-5 business days after shipping. 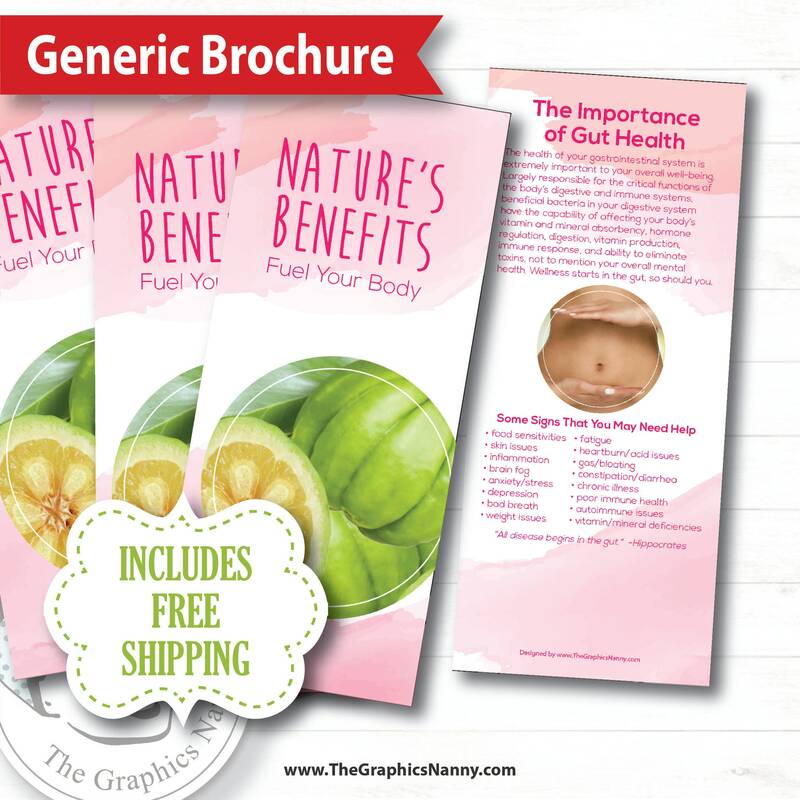 Brochures are sent same day or next business day, based upon availability. If at anytime, you need help or have any questions, please contact us and we will be happy to help you. We are here to help you succeed as an Ambassador. Just go to our home page and click on "Contact Shop Owner" and the first person available will respond to you asap. You can always leave your phone number if you prefer a call back. Because we are on Pacific time, please let us know the best time for us to call. 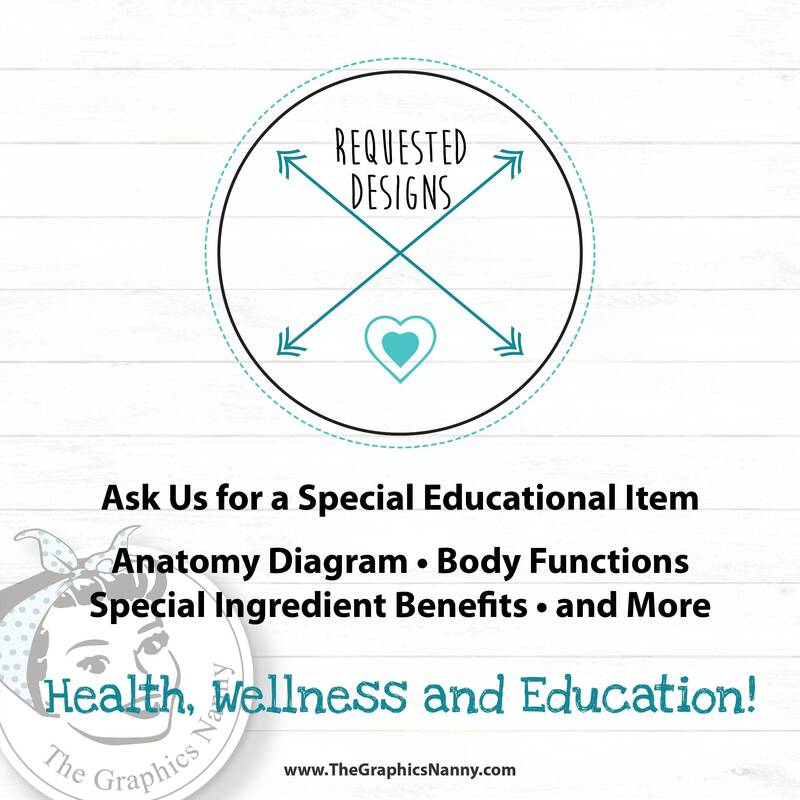 All designs in this store are copyright of The Graphics Nanny and PJS Holdings, LLC and may not be reproduced without permission. These designs are straight from our heart, designed with you in mind. *Free shipping is for initial shipping only. If package needs to be reshipped (ie, wrong address, lost package, etc) for whatever reason, free shipping will not apply to the second shipping. Etsy states that you will receive a downloadable file once payment has been made. However, some files have custom information and will need to be created before your final file is finished. We will "convo" you to inform you of your final layout and where to retrieve it. 9am - 5pm PST. If you placed your order outside of these hours, the start time will begin on the next business day. Custom orders will need to be proofed and approved by you before they are sent to production. 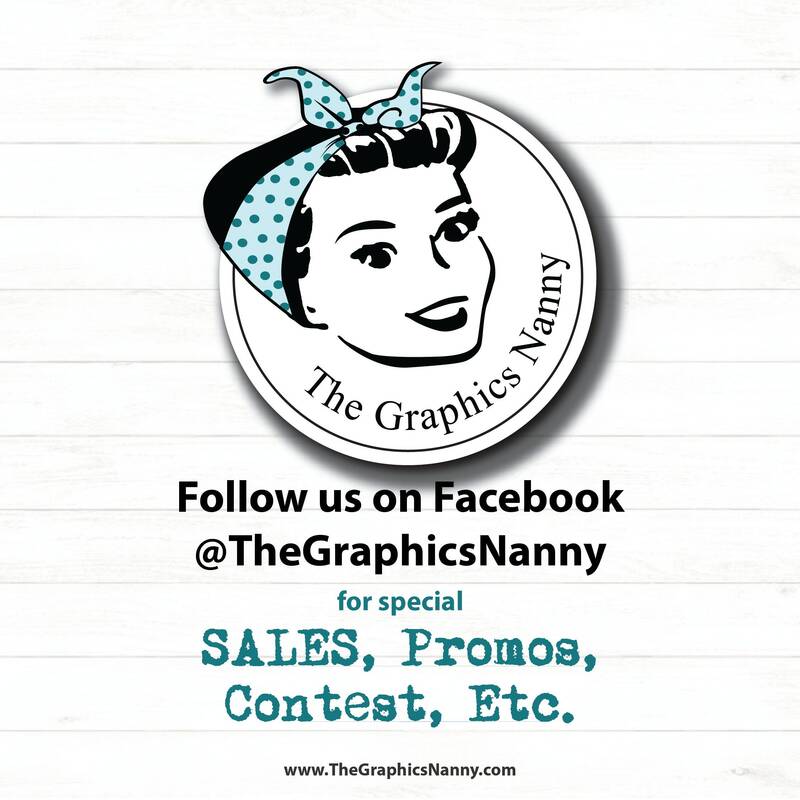 The Graphics Nanny will not be responsible for typographical errors that have been sent to production. Accuracy of the final printed product is our customer’s responsibility. It is therefore very important to read proofs carefully. However, please notify us immediately if there is something that you would like to discuss. Perhaps we can catch the order before it has printed or shipped. Once you purchase a custom item, you will receive a proof to approve or the final digital file, depending which item you ordered. If there are any corrections, please notify us immediately and we will make the corrections and resend the file back to you for your final approval. Be sure that your email address associated with your ETSY account and shipping address on file are correct. An ETSY conversation is where the proofs will be sent and ALL communication will take place. Please check your contact information to be sure that it is correct in order to receive your files, proofs and/or physical items shipped. Many emails end up in the junk folder due to the filter and therefore never seen. For turnaround times, please see this "policies" page. 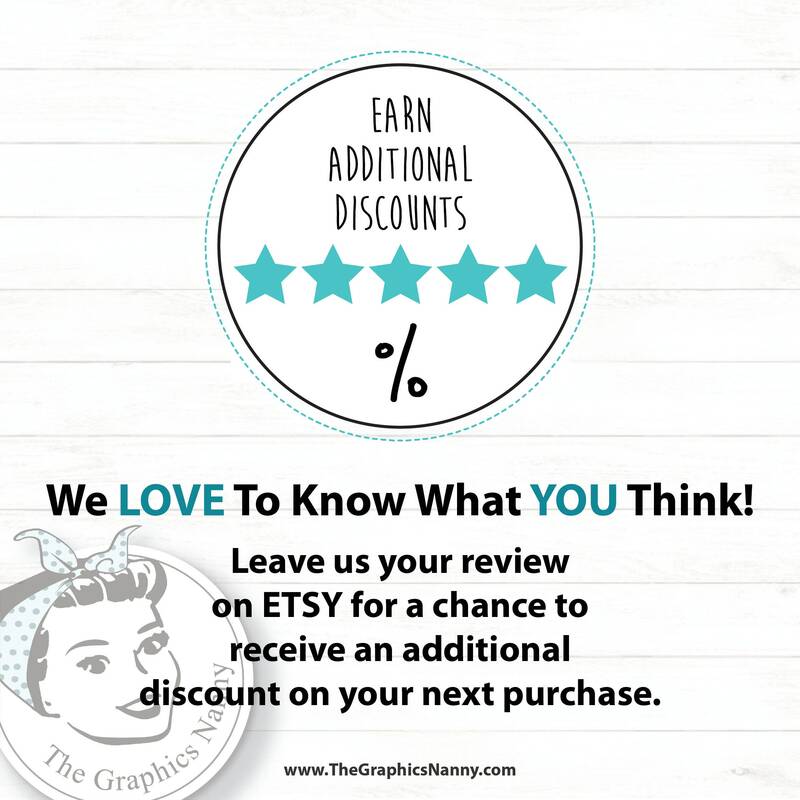 For specific questions, please send us a conversation via ETSY. All of our communication is through ETSY conversation. Proof approval from you is heavily recommended. Our policy allows 5 days for feedback on your proof. We will send you one courtesy reminder to approve your proof. If we receive no response, we reserve the right to print "as is" and release the responsibility to you, under the assumption that you have waived your option to approve your proof. If there is an error, additional charges may be applied to correct your order. *Please note: We are not in our office on the weekends, (Starting Friday 5pm) but will return to our computers on Monday morning. We answers ETSY conversations in the order that they are received. We always appreciate your patience as we sort through the sea of notices. STANDARD POSTCARDS/BUSINESS CARDS *of 100 QTY or more. ****Approximately 10-17 BUSINESS DAYS to show up on your doorstep, after proof approval!! Please keep in mind that our business hours are M-F 9-5pm. If you place your order after our office is closed for the day, then your order will be considered to begin on the following business day. If you place your order after 5pm on Friday, then your order will be processed beginning Monday morning. If you are on a tight deadline, then please message us and we will do everything that we can to accommodate your timeline. All items will be mailed to the address that you provide to us during checkout associated with your ETSY account. Please note that Paypal is not linked to ETSY as far as account information, therefore address changes need to be done on ETSY . The Graphics Nanny will not be responsible for retrieving your items if you have not updated your address. However, if the item is sent back to us in the mail, you can purchase additional shipping so that we can forward your items to you. Occasionally, customers provide the wrong address. In this case, a 15% administration fee will apply to any refunds given on brochures if you choose not to have us mail them back out to you, due to the amount of time involved. You will be refunded a portion of the brochures only, minus the postage that has been used on the incorrect address. Some delivery areas require additional shipping, if this is the case we will contact you to discuss additional shipping fees. We will not know until the order is placed. Hawaii almost always will incur an additional fee. Most items will be shipped using UPS Ground, which means that we cannot ship some items to a PO Box. If PO Box is your only option, then an additional shipping cost may occur. Brochures are shipped via USPS, therefore PO Boxes are acceptable. Because of the frequent company changes and updates, we are unable to accept returns on physical brochures. If you have any concerns, please email us within 7 days of receiving your items. Thank you for your understanding. In order to continue to offer our customers an occasional sale, we are unable to issue credits or refunds for items that were purchased at regular price, but have gone on sale since your purchase or prior to your purchase. If we have not yet started to process your order and you wish to cancel, please notify us immediately and we will gladly refund your payment. However, once any initial contact has begun and/or products have been ordered, refunds will be issued on the incomplete portion of the order plus a 15% administration fee will be added. For instance, if you have purchased business cards to be printed and you cancel your order after seeing the proof, due to the fact that the design work has been done already, the refund will be issued on the printing and shipping portion only, minus 15%. We can not issue refunds on any items that have been shipped. We thank you for your understanding. If you need to contact us, please send a message via ETSY conversation and we will get back to you as soon as possible. We are in the office Monday - Friday 9-5 PST. Please note that we answer emails in the order that they are received. Many times, email and Facebook messages end up in the junk or "other" mailbox and we may not receive it. Thank you for your patience.